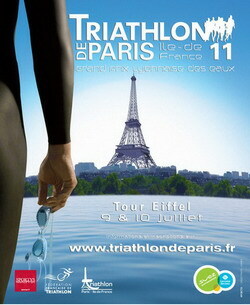 My participation in the Paris Triathlon this year is imminent. 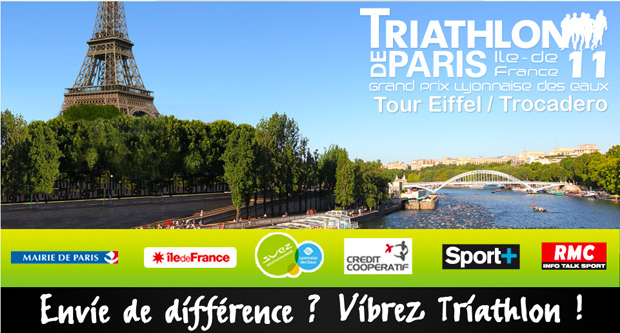 I am participating in the ‘Short duration Triathlon’ category in groups of three, and my contribution is cycling as you probably imagine: 40 kms from Paris around by going through the Bois de Boulogne, the Hippodrome, Roland Garrros and turning point: The Eiffel Tower! We wanted to use this event to raise funds for schools in Haiti, but we started to raise funds a bit late unfortunately. If you are interested in sponsoring me and would like to donate let me know. The Triathlon Short Competition : this type of competition Olympics-inspired consists of 1500m of swimming, 40 km cycling and 10 km of running. It is open to individuals or teams (relay), which is the mode in which I am participating with colleagues from work. It’s three groups of three participants each group. The registration fee is 50 euros to 70 euros depending on the order of registration and whether the participants are registered with the ‘federation’ or not. Swimming: 1500m circuit on the Seine in a straight line: Departure from the Alexandre III bridge arriving to the end just under the the Eiffel Tower, at the foot of the Jena bridge. Bicycle Circuit (this is the one I am doing): 40 km: Departure from the Musée du Quai Branly along the Seine until you reach the Boulevard Exelmans, hence the ‘Porte d’ Auteuil ‘to enter the Bois de Boulogne (Bois de Boulogne). After making a loop in the forest of Boulogne, we will return to the Seine by Georges Pompidou and New York Avenue to the transition area, taking the same route as the outward journey. foot race circuit : 10 km (5 miles from the circuit to perform 2 times): the race will take place between the two banks of the Seine from the Avenue de Suffren, over the bridge of Bir Hakeim, Trocadero Square, Avenue Président Wilson, and finally the Alma bridge in the direction Pont d’Iena. Although I was not that enthusiastic about this event at the beginning, now I am really look forward to participate.